Frequently Asked Questions about Investment Analyzers and Stock Market Predictor. The more methods and information are taken into consideration, the more precise an investment-related solution and, consequently, the more profitable is investing. There is Expert Method. This method can be explained by following. As example, an experimentalist shows a pen and asks about 40 people to write down their estimate of the length. Then he collects notes and calculates the average number – normally it is almost 100% accurate. Why it works? Everyone makes errors in different directions so that averaging gives a precise result. There is a webpage where you are invited to build a collective forecast. Please share your opinion by voting and see the result of composite forecast. If you use more than one method, approach, or tool for prediction, it could be reasonable to give a vote for each one. All participants may benefit from building a simple average forecast. However, do not put too much trust in any method alone – make your own conclusion. The stock market can be presented by S&P-500 index. It is possible to build its different statistical forecasts using historical data. The purpose of the research was to compare two statistical methods: one that based on Cycle Analysis, another – on Neural Network. We used price and volume data to train this particular Neural Network. A picture below shows how actual 5-day performance (yellow line) differ from predicted performances by these two methods. The top half is the comparison of Neural Network prediction, bottom half – Cycle Analysis. Green bars mean buy signals, red – sell. Cycle Analysis prediction gives signals too early, Neural Network prediction – too late. 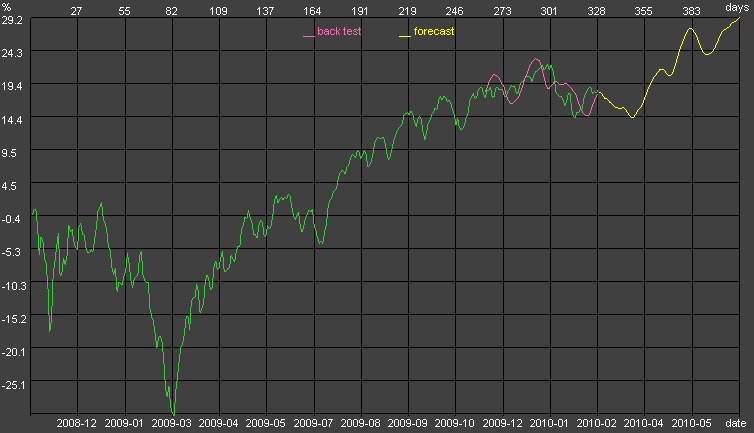 In average, Cycle Analysis prediction showed slightly better accuracy than Neural Network prediction for the last six months (from June 2009 to January 2010). It it possible to get a superior prediction by combining these two methods. Knowledge is power; and unlike other resources, it does not diminish when it is shared but multiplies. Expected performance of a stock depends on quality of the company, market evaluation of its stock, and macroeconomic environment. Also general market conditions and news are significant contributing factors in stocks performance. That is why, a good investing decision should be based on a multi-dimensional consideration of many criteria. Consequently, one of the optimal solutions is to use fundamental, technical, and timing analyses together …read article "How to Become a Successful Investor"